The orginal article was published in German on Spielverlagerung.de. Thanks for the translation to Stefano Soudias. In a strange, tactically confused and slightly chaotic match the Everton Football Club have achieved a 4:0 victory over Pep Guardiola’s Manchester City on Sunday. The highly discussed Guardiola thereby suffers the biggest league loss of his career, which fueled the critics’ (and Premier League advocates’) fire. Furthermore he used fullback legend Zabaleta in central midfield. Unlike some depictions, Zabaleta was not used as a second pivot next to Yaya Touré, but as a right, central midfielder in a diamond (therefore wider and closer to his natural habitat). This diamond was completed by de Bruyne on the left and Silva as a freely moving number ten. Sterling did not play on the wing, but rotated as a left-hand second striker behind Agüero through the space between the lines. Everton used a 3-5-2 (or rather a 3-5-1-1) in which Gareth Barry was accompanied by the young Ross Barkley and the 18-year-old Premier-League-debutant Tom Davies. This game notably developed into a duel of these three players against de Bruyne and Silva. The latter attempted to orchestrate the game from unusually deep zones (they summed up 199 passes!). Often they dropped so far within the half space, that they received the ball even deeper than Touré. Zabaleta moved mainly to the right in order to open the space for Silva. Partially, Silva and de Bruyne together moved into the same space. In general there was a lot of movement and a broad variety of structures. Everton played in typical Koeman-fashion with lots of man-orientations. Especially Barry controlled the space in front of the back by marking possible options. Davies and Barkley then defended the spaces and opponents very flexibly and intelligently. There even were scenes in which Barry moved away from the ball and in response Davies shifted to the left in front of him in order to protect the center. They were not extraordinarily well organized, but often this was compensated for by Everton’s very good pressing-decisions. They were passive when access was not possible and protected offensive passing lanes, but suddenly went for ball recoveries as soon as they could create defensive overloads and moments of isolation. For this, Everton’s midfield-three was often supported by Lukaku and Mirallas. The latter dropped back as a fourth midfielder at times. Lukaku attempted to isolate Touré and waited for moments to create pressure in front. The tactical behavior of the Belgian developed excellently in the past years and therefore he was able to find good pressing moments in order to force City into a few bad wing progressions. It was eye-catching how actively he coached his teammates behind him in order to close possible ways of escape out of the isolated space. Sometimes Everton even moved up into a high pressing and forced City into playing long balls. Also the wingbacks and defenders of Everton acted flexibly and intelligently, moved up to press at times, dropped deeper at other times. In general Everton were not extraordinarily intense and rather laxly organized, but functioned due to all players being active and concentrated when defending, they communicated a lot among each other and especially re-oriented themselves well and did so constantly. Furthermore City were not well organized in order to exploit a 3-5-2. Usually, it is a lazy approach to view units of a team isolatedly in order to bring about tactical understanding – in case of this match it works well enough though: Everton’s three defenders could comfortably control Agüero and Sterling by them having one more player. Also because there were no wingers, which they would have had to flexibly hand over among each other. The space next to the back three was controlled by the wingbacks, who had a manageable task against Clichy and Sagna. 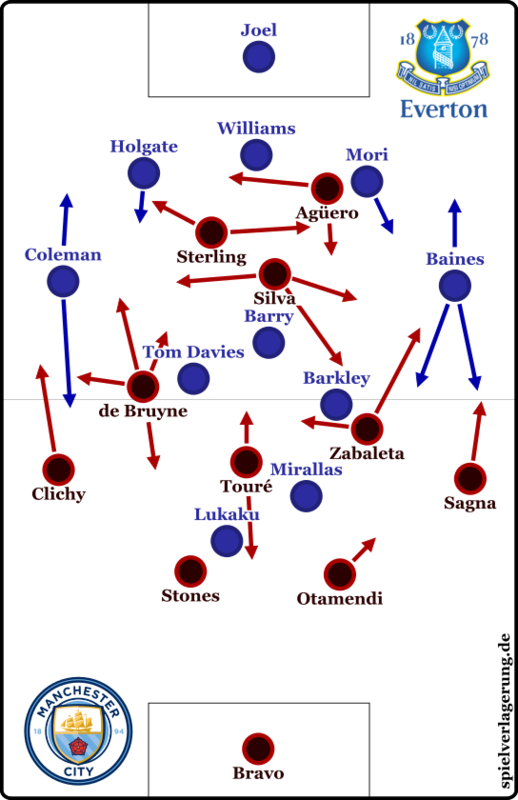 The City-midfielders rarely moved into these spaces; Silva and de Bruyne dropped extremely deep, as mentioned above. Their presence was therefore lacking in the spaces between defense and attack. The two of them basically undertook the task, which is usually done by one player, Gündogan (or Fernandinho), who additionally does it better than them. Especially Silva positioned himself slightly too ball-oriented and was not farsighted, which is why he rarely manged to create direct connection forwards out of his deep positioning. Eventually this created some sort of 2-1-5-0-2 in which City could not advance to the attacking line, but were forced to circulate the ball in deeper midfield zones. By doing that they could hardly gain space though, because Everton’s midfield line defended cautiously and did not allow themselves to be drawn out of their positions. Sterling comes too deep, can’t turn and is easily covered by Davies and Mirallas. Silva is marked by Barry but still comes deep for no reason just to play a backwards pass. The ball-far space is not used, the ball-near structure is not work. Theoretically, City could have advanced on the wings in order to respond, where they could have overloaded with Silva, the near central midfielder, wingback and striker. They only did this partially though, often times with just two players – on the left with multiple times with Clichy and de Bruyne, on the right with Zabaleta and Sagna. Everton constantly managed to decelerate those attempts through the wingback orienting himself towards the player who was closer to their goal, so that their midfield-triangle could shift. City did not play quickly and dynamically enough in the wide areas, in order to exploit the underload around the wingback, but kept a calm, circulation-focused rhythm. Also the fullbacks did not move up a lot. It seemed as if Silva and de Bruyne should break through in the half spaces. This did not succeed though, because the connection between midfield and attack was lacking. Basically, Sterling would have been the key-player in this structure. If he had integrated himself in the right moments, in order to turn behind Barry and dribble towards the back line, Everton’s defense would have gotten massive problems with him and Agüero. But that is not Sterling’s playing-style. His wide, horizontal movements indicate, that Guardiola also did not demand that of him, but rather use him for 1-v-1-situations against the halfbacks and to create overloads on the wings. But even this Sterling did not manage to do. He generally seemed overwhelmed with the positioning in this role. The lacking routine of this combination of players in midfield and their versatile movement negatively influenced the build up play. The defenders – especially Clichy and Otamendi – seemed to be slightly confused by all the movements in midfield in these situations and played strange, hurried vertical passes in bad situations and occasionally to the opponents. Clichy initiated the 1:0 by a pass like that. The roles of Touré and Zabaleta in this system seemed rather cryptic. Touré’s fitness and defensive strength are not on a level anymore that allows him to play the sole defensive midfielder role without problems. He also lost the ball before the 2:0 and opened the space in his position. He occasionally dropped rather ineffectively between the defenders or vertically moved up in order to use his creative abilities but did not manage to create connections to Silva and de Bruyne and additionally opened the space around his position for that purpose. 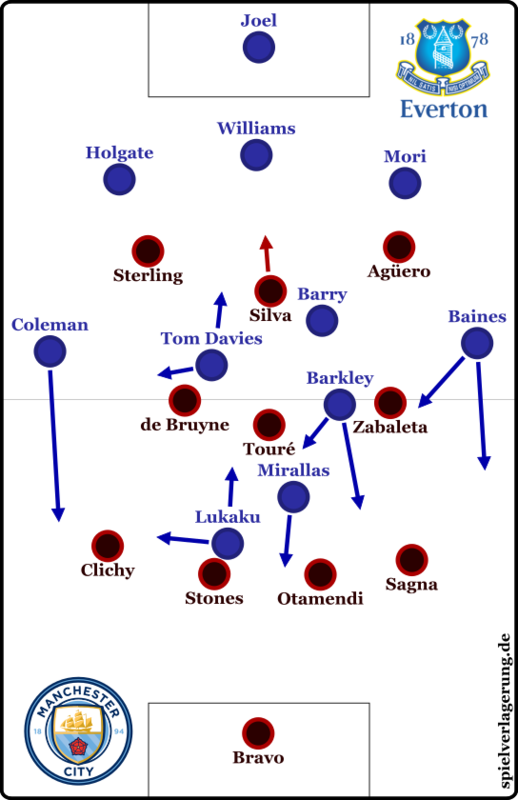 Zabaleta then strangely switched between a balancing and an attacking role. Sometimes he moved around Touré, partly secured him, or positioned himself in order to be available. More often he moved to the right where he theoretically could have overloaded together with Sagna, which was not really used though. Instead there were scenes in which it seemed as if his teammates consciously avoided to pass to him. It is of course clear that in such a role he was supposed to participate primarily during movement and pressing, instead of acting in a playmaking role. If he is the only player available and unmarked he quickly should be integrated though. Especially since Everton did not defend the far half space intensely and Zabaleta therefore often had a lot of space to easily circulate the ball whenever he was integrated. An unlucky circumstance was that the Argentinian could rarely use his defensive skills against the ball because Everton did scarcely attack on his side. In possession Barkley moved more towards the ten space or into the attacking line while Barry and Davies created a structure with two pivots that was slightly shifted towards the right side. Often times Lukaku attempted to participate through dropping at half-right. That way he excellently assisted an offside-goal early on. Before scoring the 1:0 he could get rid of the defenders that way in order to receive the ball from Mirallas and before the 2:0 he played the second last pass into depth. Three of Everton’s goals were scored after long balls into the right half space. They attempted to build up with clean passes, but City prevented that well. Agüero and Sterling blocked passes to the half- and wingbacks, Silva moved up between the two in order to apply pressure on Williams. That way they often provoked long balls for which they did not have great structures though. The fullbacks moved up early in order to attack Coleman or Baines, which destabilized the defensive line. In the space in front of the back they had to face Lukaku, Mirallas, Davies and Barkley. That way all goals were created through the channel between Clichy and Stones. Apart from Davies’ exceptional run before the 3:0 it was the second balls after long passes to Lukaku, which created the goals. Thereby City especially had problems with their defensive orientation and communication: a pattern during all goals was players moving up to create pressure without anybody covering the spaces created by these movements. Despite of the great deficits in the Manchester-midfield, Pep Guardiola’s team was still mostly dominant. That was due to the good pressing patterns in the first line and the stable ball circulation throughout the defense together with Bravo: he solved some of Everton’s pressing attempts well. That way City basically controlled the game and only allowed a few attacks. Through individual quality – especially de Bruyne – they occasionally could create dangerous moments out of rather harmless structures. Apart from that they also had some giant chances after counter attacks when Everton moved up a bit. Over the course of the game Everton got increasingly less present. Especially in the second half, where they dropped deeper and did not defend at the halfway line but rather in the final third. By doing that they could rely on the usual compactness of a back five with three defensive midfielder in front and therefore where hard to outplay. Additionally, Guardiola did not find functional adaptions – and also attempted surprisingly few things. At first de Bruyne started much more active in the second half. He did not drop that deep to receive passes anymore, dribbled much more and moved into the center, between Everton’s midfielders. Oddly enough, that aspect disappeared with time. In minute 62 Zabaleta left the pitch for Iheanacho, who played as a left striker. Sterling played more like a number 10, de Bruyne moved to the right central midfield and Silva on the opposite side with a playmaking drive towards the center. Now the build up became more asymmetrical. The right side acted much more offensive: Sagna moved up a lot and even orientated himself towards the central forwards position. That way he pulled back Baines and created space for de Bruyne to move into and deliver crosses from. The area in the right half space that was created by this synergy was filled by Otamendi increasingly moving up. The attacks on the right did not work well enough though, because Everton could defend the crosses with many players inside of the box. 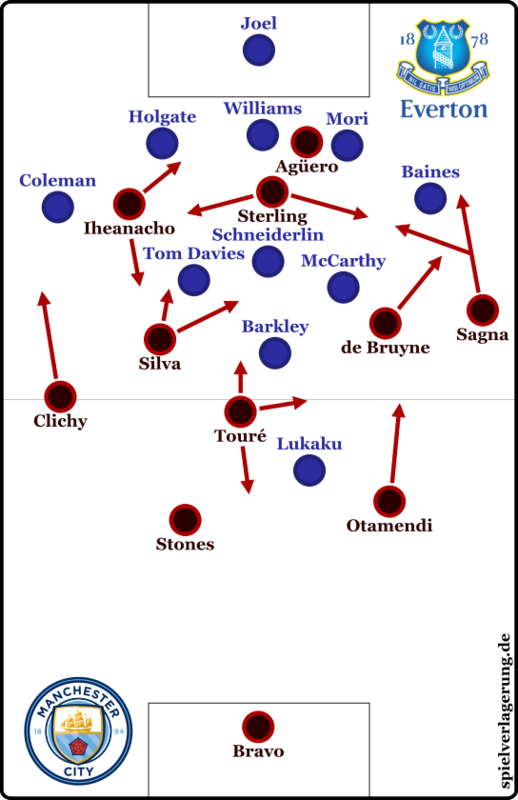 Often City progressed over the left side now, where Silva, Iheanacho and Sterling had, ought or wanted to combine. Unfortunately, none of these players are real combination-players. Sterling’s timing and orientation was very problematic and therefore City hardly ever progressed behind the three defensive midfielders. In fact, one attempt to combine between Sterling and Iheanacho lead to the loss of possession, which initiated Davies’ run before the 3:0. On the one hand the anti-intellectual Guardiola-critics are now happy to see the ‘professor’ and his weird experiments failing. On the other hand Guardiola was also heavily defended, especially on the basis of the statistics: Everton just had 6 shots, while City accomplished 13. According to ‘expected goals’ City were even more dangerous than Everton. Actually, Everton were probably not good enough to justify 4 goals. City’s xG of 0,83 is still bad for a title contender though and illustrates a lack of offensive capabilities in this match. Due to their dominant style they still could control the opposition, yet Everton’s chances were probably better than their xG (all of their chances with hardly any pressure by the opposition, which cannot be tracked by the metric). Furthermore the chances were no lucky individual events but were already indicated by the offside goal and a few other dangerous scenes. The 4:0 is therefore an overly one-sided result, but that can happen when one is just equally good or worse then the opponent. It is also not the case that Guardiola’s many changes and adaptions are necessarily bad and cause insecurity. The structural advantages of the changing of system can outweigh the disadvantages, furthermore teams can also quickly adapt to new systems (if accordingly chosen) and work well within the new framework. However, not all changes of systems by Guardiola are equally good (or bad). Often times he can adapt and bring changes and impulses about which eventually lead his teams to victory. Sometimes his ideas do not work as intended and the changes are disadvantageous. Often times it is probably in between those extremes and is not that relevant. That might be why Guardiola says that he is still a young coach who learns a lot. In this game Guardiola rather should have changed much more and much earlier. He might not have because he tried to build a new system during the training-week and wanted to wait for Sterling and Silva adapting to the new environment. This game is also noticeable and strange, because Guardiola actually departed from his usual playing style of the last years (wing-focus, fast switches, 1-v-1, crosses). He rather used the wings less, and attempted to integrate the 1-v-1-players in the center. All of them in spaces which are not their natural habitat though. Eventually, this result might simply encourage to conduct discussions about coaches (and football-ideologies) in a more sober-minded fashion. Being a coach is extremely difficult. One can get a huge amount of things wrong. One can also make a ton of things right and still lose. One can also make a lot of things wrong and still win. One can also make almost everything right with one team and still get more problems in a different environment. There is simply no coach in football history, who was exceptional at every aspect. Everybody undergoes better and worse phases. That people are bothered by a Guardiola-hype is one thing. When they therefore want to depict him as a failure and belittle all of his achievements despite of underlying facts then that is childish narrow-mindedness; especially because it’s a different standard applied for him then compared to all other coaches. At the same time it is true, that Guardiola is no magician and also makes mistakes. Of course the style that made him, was also created by his players and neither style nor success can be exactly transferred from one team to another. Differentiated points of view are cool. Ciao.